"Dial a future, deliver a present." Want to put systemic challenges on the radar of your local Congressman? Help a relative living on the opposite coast to prepare for climate change? Send a 30th anniversary gift to the couple just now celebrating their 10th? Share a dream for a brighter world with your kid? 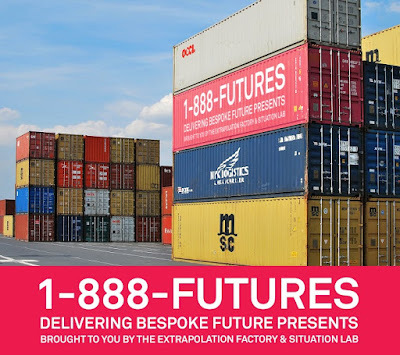 1-888-FUTURES is a service that takes a future dream, vision or problem, renders it tangible as a "future present", and delivers it to a specific individual. You, the visioner, call the hotline and place a request for delivery of a future present based on some image of the future that you describe in your message. Our dedicated staff retrieves the message, finds a way to make the dream into a specific artifact, boxes it up, and sends it to your chosen recipient. The future present recipient – whether it's you the visioner, or someone else – may choose to keep the package as a mystery box until the stated opening date, or may instead open it sooner, and be duly delighted/horrified/provoked/touched/nonplussed by the contents. A transcript of the original dream recording will be posted together with the artifact inspired by it. A lot of work in the design fiction / speculative design mould is created, it seems, for no one in particular. Even if produced only once (like an artwork), often in effect it's a mass consumption object rather than something made for one. 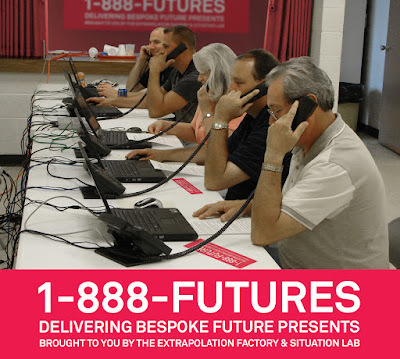 So 1-888-FUTURES is a small experiment in making such future design more personal and personalised; a true gift, connecting the imagining and creation process to a named individual, an audience of one. This is the third "Futurematic" design jam jointly run by Situation Lab (Jeff Watson and me) with New York-based design collective The Extrapolation Factory (Elliott Montgomery and Chris Woebken). Graciously hosting on this occasion is the University of Southern California's Visions and Voices series, with the priceless collaboration of Professor Jen Stein from USC's School of Cinematic Arts. Futurematic events riff playfully on commercial and industrial making processes, while focusing on the very non-industrial, not-yet-massified design space of imaginary objects. At the first event, participants filled up a vending machine with future artifacts in a day last spring at OCAD U. For the second, last summer at NYU, people created and put future street merchandise on sale at Canal St and Broadway in Manhattan. Both those events used Situation Lab’s imagination-boosting card game The Thing From The Future as the creative engine. This time, the ideation engine is the public's imagination itself. 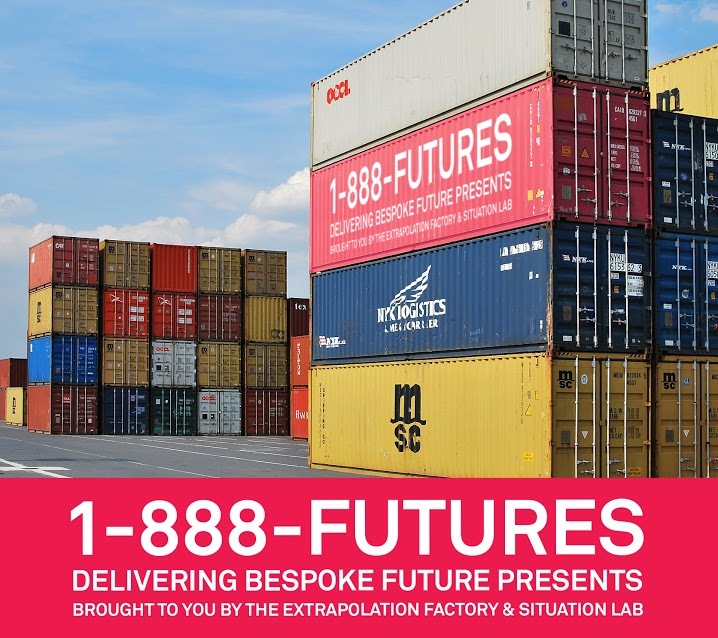 With that as the driving force, workshop participants will send out as many "future presents" made to order as we can, from our temporary 1-888-FUTURES fulfilment center in Los Angeles to all over the country. The whole thing is free: so long as the delivery address is in the U.S., callers from anywhere can participate by calling 1-888-FUTURES from skype. But this offer is limited - so call now! The lines are open 24/7 until midnight on Saturday, September 19th. 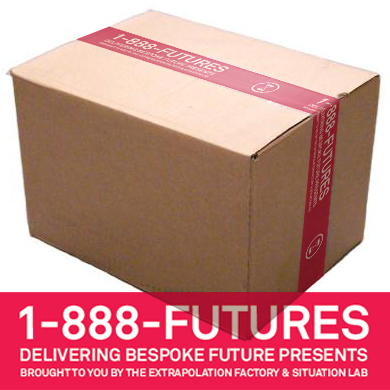 Browse the catalogue of future presents, designed, sealed and delivered, at 1888FUTURES.com. Thanks to Jen Stein, Jeff Watson, Danyel Copeland and Josh McVeigh-Schultz, and the rest of our hosts and helpers at USC. Thanks also to our Futurematic collaborators Chris and Elliott, aka The Extrapolation Factory, and not least to our wonderful workshop participants!